As you might know, sellers can now share their posted items right onto their Facebook timeline. Once a potential buyer clicks on the link that was share on Facebook, he or she is sent to the appropriate item inside our swapit app. 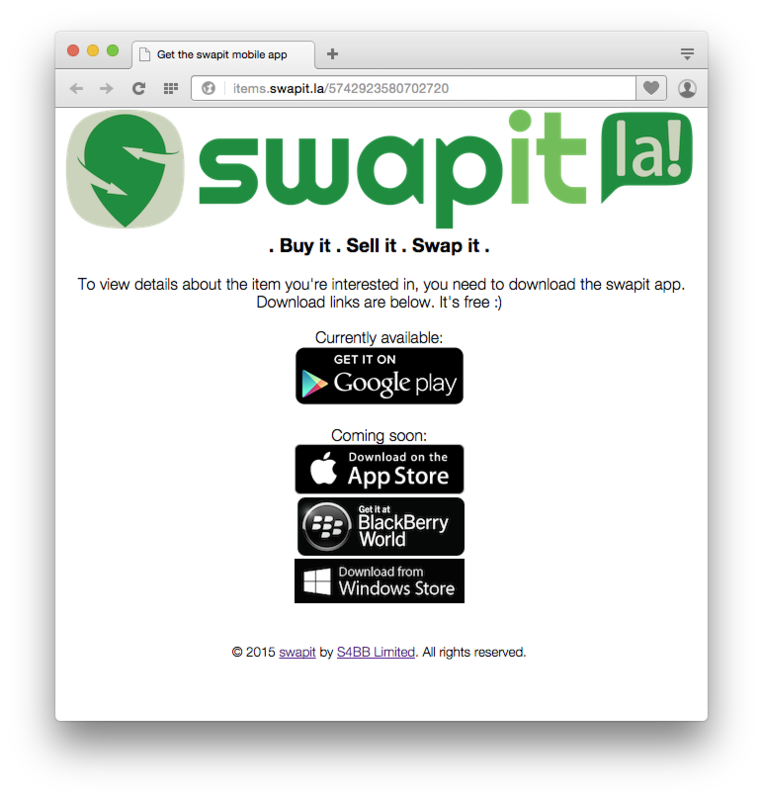 Now, if the user doesn’t have the app installed, he or she sees a notice to download swapit from the app store. That’s how it was and that’s how it remains. New is, that users now see a preview teaser of the item they want to view. This allows us to engage better with our users and to draw more potential users through our funnel and into our app. In the end, that actual item can only be purchased through the swapit app. Furthermore, only inside the swapit app, additional information like the item’s location, more pictures and the full description can be viewed. Hence, the viewer is encouraged to actually install swapit and find out more. As you can see, we kept the design very clean and simple. The sole purpose of this page is to create more interest with the potential user and drive him or her to download swapit. In fact, we are great fans of Instagram who incorporate a similar strategy to offer some parts of their content on the web, while the juicy stuff remains only accessible through the mobile app. We are working towards a better and more optimized user acquisition and on-boarding process. It needs to be dead simple for users to get swapit if they want to give it a try. This entry was posted in tech and tagged funnel, teaser, web by Patrick Kosiol (swapitla). Bookmark the permalink.